PM Narendra Modi was addressing the Indian-origin community in the Netherlands. Prime Minister Narendra Modi concluded his 3-nation tour in Netherlands today. The Hague: India will soon take a decision on granting five-year business and tourist visa to Dutch passport holders, Prime Minister Narendra Modi said tonight. He made the announcement while addressing the Indian community at The Hague just before concluding his day-long visit to Netherlands, which has the second largest population of the people of Indian-origin after the UK. In his hour-long speech, Mr Modi talked about his government's endeavour to ensure progress and modernisation of India. He highlighted the diversity existing in India and said it was the country's "speciality" which puzzled people in other parts of the world. "India is a federal country in true spirit," he said. The Prime Minister said his government's thrust has been on "jan bhagidari" (people's involvement) in governance as he believed that the country's progress cannot be ensured only through the government's work. Referring to solar energy, PM Modi said its cost has fallen drastically and was almost at par with fossil fuel. "Did the Sun start appearing only after I became the Prime Minister? Was it not there earlier? I could see it but they (previous governments) could not," he said. Talking about electrification, PM Modi said when he took office, he was told that 18,000 villages did not have electricity even 70 years after independence. He then asked, "What is the difference between 18th century India and 21st century India, if even after 70 years of independence, 18000 villages do not have electricity?" He said after becoming the prime minister in 2014, he asked officials how long it would take to electrify all the 18000 and was told that it would take 60 years. 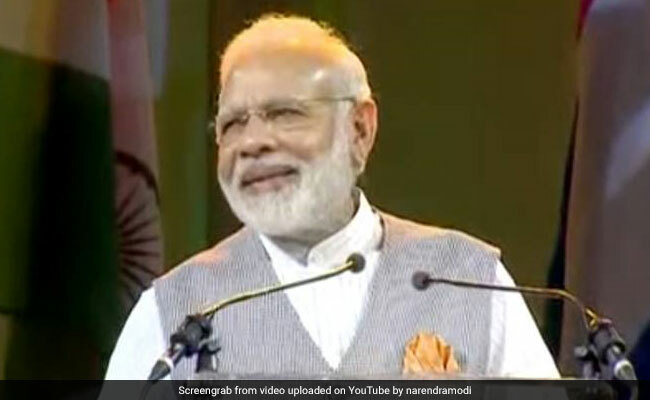 "I told them it has to be sped up... And then, from the Red Fort on the Independence Day, I announced that the 18000 villages will be electrified in 1000 days. Those 1000 days are yet to end but 13,000-14,000 villages have already been electrified and the work in the rest of the villages is being done at a fast pace," PM Modi said.